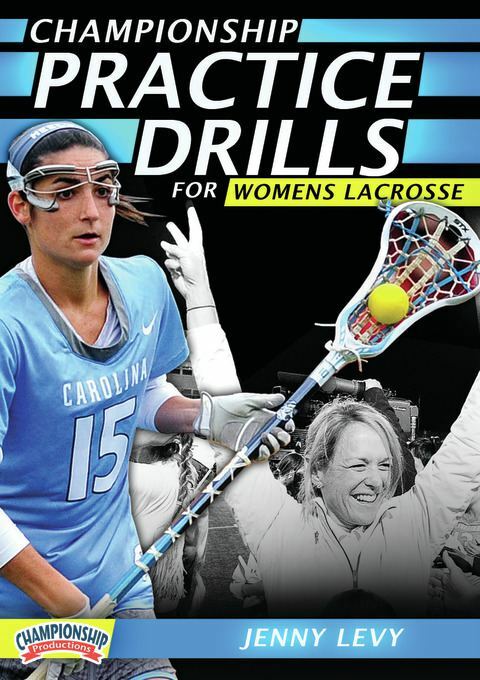 See how champions are built in this guided practice from Jenny Levy, head coach of the 2013 NCAA Division 1 Champion University of North Carolina. Coach Levy, one of the sport's all-time greats, guides players through skill-building drills that can be used at every level, intermixed with whiteboard segments and technique presentations by Tar Heel assistants. Coach Levy and her assistants take you through a fast-paced, high-energy practice from warm-ups to 7-on-7 play. She shows how to keep everyone moving with lots of one player/one ball drills that simulate game-like competitive situations. 4.Whiteboard schematics for North Carolina's transition patterns and how they're used to set up high-percentage two-on-one scoring opportunities. Coach Levy's stick work and footwork warm-ups demand precise execution. Careful attention is given to stick position when passing and catching to ensure that each player maintains the"Triple Threat" position. From there, the practice evolves into short, intense drills that simulate game-like situations, building to a half-field settled offense. Combining the advanced techniques taught in partner passing with attack drills, Levy uses 3v2 to allow players to work on timing and shooting at game speed. These concepts are further developed with the 5v4 fast break drill. The 7v7 is demonstrated to teach the motion offense from a 4-2-1 formation. Cutaways illuminate the staff's approach to essential individual technique like marking a cutter, pick play on the crease, and creating good stick protection skills. Don't miss this opportunity to learn from one of the best in the game! Coach Levy's practice is a gold mine for teams at any level and any offensive or defensive philosophy.